On January 20, 1942, fifteen high-ranking members of the Nazi Party, the SS, the fascist economic administration, and the government bureaucracy were summoned to a top-secret meeting in the quiet Berlin suburb of Wansee. There was only one item on the agenda. The meeting lasted all of 90 minutes. At its close, the attendees were granted time to memorize their notes, as all scratch paper and note pads were to be collected and burned. There was to be no trace of this meeting ever having taken place. Hosted by SS-Obergruppenfuhrer Reinhard Heydrich, head of Reich Security and second-in-command of the SS, the meeting had a single purpose: to orchestrate the annihilation of 11 million people. This chilling event, known to historians as the Wansee Conference, is the subject of director Frank Pierson’s 2001 film, Conspiracy. Pierson (1925 – 2012), whose other films included The Looking Glass War (1969), A Star is Born (1976), and Citizen Cohn (1992), based his interpretation entirely on the single known surviving record of the Wansee Conference, a transcript of the meeting which was discovered buried in the archives of the Nazi Foreign Office in 1947. 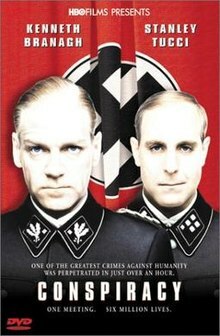 Headlining Pierson’s cast were veteran performers Kenneth Branagh as Heydrich, Stanley Tucci as Heydrich’s chief aide, Adolf Eichmann, and Colin Firth as Nazi racial “theorist” and author of the fascist regime’s racist legal code, Dr. Wilhelm Stuckart. The Wansee Conference did not initiate the extermination of the Jews, indeed, the purpose of the Conference was to secure the active cooperation of key sectors of the Nazi state apparatus in the extension of a policy already being carried out. From the earliest days of the war, as the Wehrmacht occupied conquered territory, the regular army was followed by SS assassination squads, the Einsatzgruppen, whose stated task was to pre-empt possible resistance on the part of the subjugated peoples by murdering any potential leadership: political activists, writers, teachers, intellectuals. From the first, the Einsatzgruppen followed close at the heels of the regular German Army, enforcing submission to Hitler’s New Order. 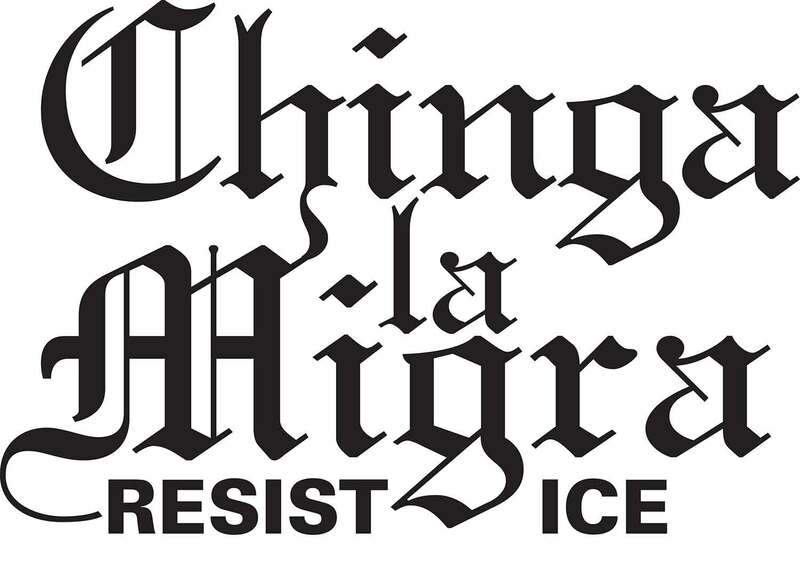 2) forcible emigration — initially realized by encouraging Jews to willing leave Germany, later developing into mass deportation of the Jewish population to the ‘East,’ typically Poland. In pursuing this dual policy of segregation and deportation, the Nazis found enthusiastic allies in representatives of the Zionist movement, who felt that Nazi severity would compel their fellow Jews to shed their European identity and emigrate to Palestine. Hence, isolation and expulsion not extermination, was the Nazi policy towards the Jews before Barbarossa. 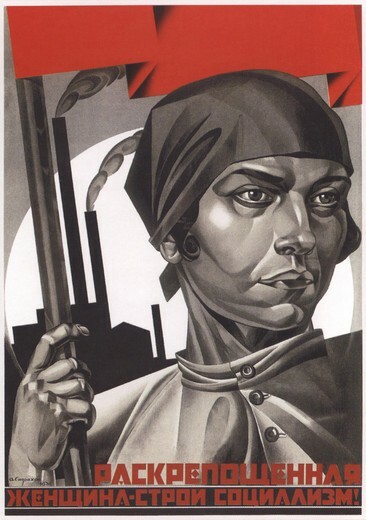 It was only with the marriage of anti-communism and anti-Semitism, that fascist policy turned to wholesale murder. Moreover, it was only with the Red Army’s fighting the German invaders to a standstill at the end of 1941/beginning of 1942 that the fate of European Jewry was sealed. The Wansee Conference, as depicted in the film “Conspiracy” (2001). The last remark was a reference to the Wansee Conference. 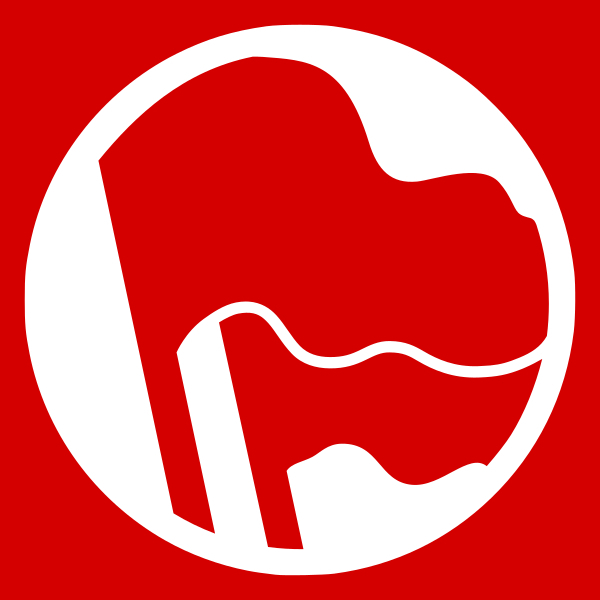 The Wansee Conference was, thus, not the orchestration of an existing plan of the “Final Solution;” rather, it ushered in the final stage of escalation of the extermination policy originally directed at Soviet communism — the incorporation of the whole of occupied Europe into a comprehensive program of genocide. This, then is the backdrop to the Wansee Conference. It is also the point-of-departure for Frank Pierson’s film, Conspiracy. 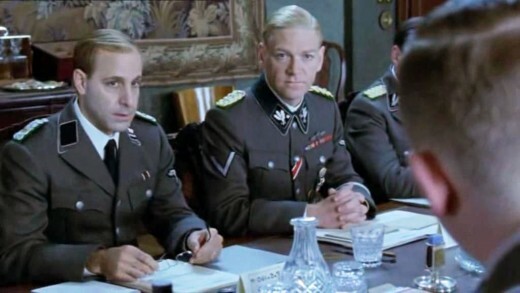 Stanley Tucci as Adolf Eichmann and Kenneth Branagh as Reinhard Heydrich. 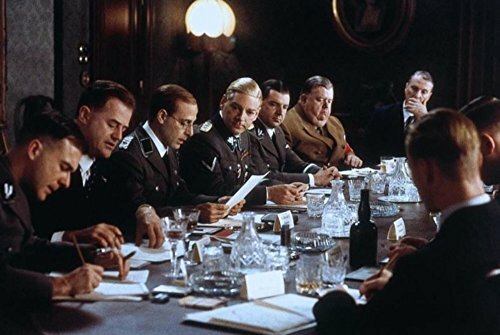 Written by Loring Mandel, and produced under the auspices of the cable TV network, HBO, Conspiracy unfolds in real time as the various Nazi officials sit at a conference table — in between sessions of cognac, cigars and hors d’oeuvres — and argue over the new policy of extermination. Pierson’s direction is brilliant. In its own quiet, sometimes even amusing way, this film steps forward and seizes the viewer by the shoulders (and intestines) and draws them down into a vision of horror that far surpasses any fiction writer’s imagination. Don’t just listen to what these gentlemen are saying…LISTEN to what is not shown as well. Watch their faces as they talk, their body language. Rarely has one seen a movie where what is not taking place on the screen is just as chilling as what is. One needn’t be shown snapshots of concentration camps, or bodies burnt or starved. There isn’t a single drop of blood oozing anywhere. Yet as the characters speak, and look, and speculate, the full horror of what they’re discussing begins to sink in. That a group of men could sit down one afternoon and casually chat about gas chambers and pink bodies, and eat lunch while doing so, is perhaps the most disturbing image conceivable. Conspiracy individualizes the Nazis at the conference, and shows the different faces of fascism. The attendees’ reactions range from insisting that Jews must be oppressed only according to the strict letter of the law to zealously uncritical compliance with orders, to cheerful indifference, to a sort of put-upon resentment that the work of extermination is falling on them. Shrewd direction, sharp writing, outstanding performances, and a meticulous dedication to historical detail make Conspiracy a powerful, potent film. Quietly, almost gently, it succeeds in capturing the evil of fascism.